Mangaluru Oct 25, 2016: The new building of Buntara Bhavana which has come up at Brahmarakootlu near BC Road will be inaugurated on October 30 by Dharmasthala Dharmadikaari Dr Veerendra Hegde, informed President of Bantwala Buntara Bhavan Vivek Shetty. Addressing media at the Press Club on Tuesday October 25, he said that inauguration program will be carried out for three days starting from October 29th to 31st. On October 29th Hore Kaanike procession will be carried out from BC Road to Bunts Bhavan. Horakaanike Vehicle will be inaugurated by District-in-charge Minister Ramanath Rai while procession will be inaugurated by MP Nalin Kumar Kateel. He further stated that on October 30th Buntara Bhavana will be inaugurated by Dharmasthala Dharmadikari Dr Veerendra Heggade, in the presence of a host of dignitaries including Chief Minister of Karnataka Siddaramaiah, Maharashtra Chief Minister Devendra Fadnavis and Cricket Legend Sachin Tendulkar. 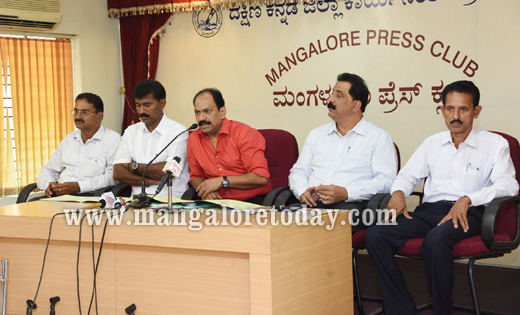 Same day “Bunta Mahila Sangama” will be organized and will be inaugurated by Puttur MLA Shakuntala Shetty. The function will be presided over by Vivek Shetty. Film Stars Shilpa Shetty and Pooja Hegde will grace the occasion . The programme will be followed by “Gurukiran Nights” cultural event which is expected to be participated by film stars Sunil Shetty, Prakash Rai, Niroop Bhandary, Upendra, Rakshith Shetty, Sudeep, Yash, Darshan and Vijaya Raghavendra. On October 31st organizers will honor eminent personalities including Dr Erya Laxminarayana Alva (Literature), Karunakara Shetty (Medical), Sadananda Poonja, AC Bhandary (Religious field ), Sathish Shetty (Art), Prafulla (Agriculture), Jaya Shetty (Kambala) and Devi Prasad Shetty (Yakshagana). With a stunning river side view, Bantwala Buntara Bhavan has come up at an estimated cost of Rs 15 crores with one air conditioned main auditorium with 1200 seating arrangement and full-fledged with sounding and lighting system. There are four auditoriums each with a 1000, 500, 250 and 100 seating capacity respectively. Buntara Bhavana consists of four luxurious guest houses and spacious parking facilities. Vice President of Bantwala Buntara Bhavan Kiran Hegde, Secretary Chandrahasa Shetty, Treasurer Jagadeesha Shetty and others were present.